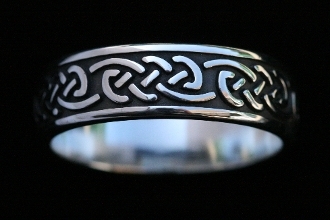 The Eternity knot is one of the most classic of all patterns used in the ancient Celtic manuscripts. The interplay of the 2 strands in the pattern have a very pleasing aesthetic, and is the basis for a number of variations in the art of the scribes. The concept of the eternal nature of life's process with all new life blossoming to completion, and back to renewal as an ongoing awareness of the continuity of life is a major thrust of the Celtic belief system. This is a very well crafted ring, and is one of my newest sets of rings for those who like to wear rings together, as I have also crafted a woman's version in a 5mm band. This one is a bit over 7.5mm, and is convex on the top of the pattern, and quite deeply etched for longevity of design. Although I originally designed this as a mens band, I am adding to the size offering on this ring to accommodate women who like wider ring types, and will start the series in a size 5 up to size 16 for larger men. Sizes will be added on the site as available.